How many redirects can I create? There’s no limit to the number of redirects you can create. All of them will be processed and applied according to the parameters you have configured. Do redirects affect my .htaccess file? No, redirect rules created through the plugin will not write any line in the .htacces file of your website. Every rule is stored in your database and apply through the wp_redirect() WordPress function. What happens if more redirect rules apply on the same page? The most specific rule applies. Let’s make an example to clarify. I have configured 3 rules: one for the whole website, one for the “Bags” category and one for the product “YITH Bag”. Users who visit the YITH Bag page will be redirected according to the rule created for this specific product, while the other two rules will not apply. I’d like to exclude all users coming from Italy from the redirect. How can I do? 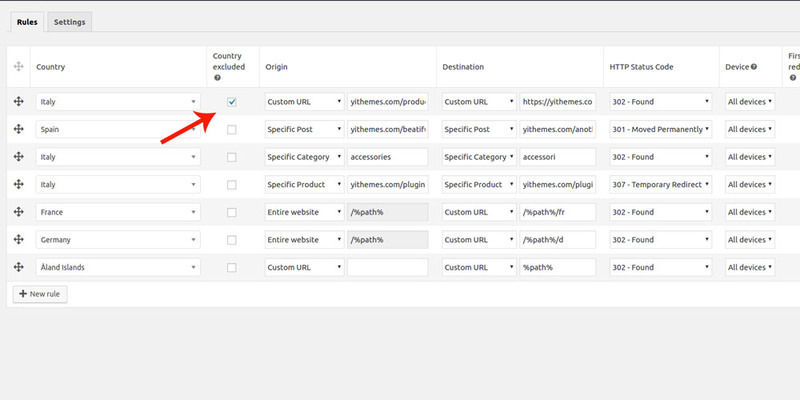 Select “Italy” in the Country fields and enable the option called “Country excluded” as shown in the image below.